Late returns incur a $30.00 per half hour fee over the arranged drop off time. All rates shown include GST. We accept cash, bank cheque, direct debit or credit card. 30% of the vehicle booking price is required as a holding deposit. Security bond for all vehicles is $4000 and trailers are $1000. Bond is refunded within 3 days after completion of hire provided that the vehicle is returned clean and undamaged. Drop off time must be before or on the arranged pick up time. Barge ticket and accommodation refund will be refunded as per their cancellation policies. Cancellation between 3 and 4 weeks prior to booking date will forfeit $100 of the holding deposit. Cancellation notices given outside of 4 weeks from the booking date will receive a refund less $50 from the deposit for administration charges. The vehicle is to be returned in a clean and tidy condition. A fee of up to $100 may result if the vehicle is not returned cleaned. This will be taken out of the bond. Smoking is not permitted in the vehicles. Pets or animals are not allowed in the vehicles. It is the customer’s responsibility to get the vehicle to a safe place if repairs to the vehicle are needed. The customers should obtain and keep details of any other vehicle involved in any accidents, malicious damage or theft and report any damage to the police and obtain a police report. Atlas 4wd hire shall not be liable for any expenditure, damage, loss or inconvenience incurred from any accident or breakdown to the vehicle caused by wear and tear or any other reason. Any major loss or damage occurred must be reported to Atlas 4wd hire on 0438 734255, 0419 886006 or 07 4125 7056 before any repair/replacement can be authorised. Any tyre repair/replacement is the responsibility of the customer and must contact Atlas 4wd hire before commencing repairs. Any tyre replacement must be of approved type (No retreads). Any damage to the tyres and rims (outside normal wear and tear) will be at the cost of the customer. Any other faulty items can be repaired in transit and the customer will be reimbursed up to $100 with authority. Receipts will need to be kept in order for reimbursement. Insurance excludes deliberate or immersion damage. Our minimum hire period is 1 day in off peak season. 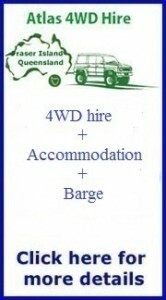 Extending hire of the vehicle before return date will be at a daily rate if not already booked. All drivers must be older than 25, and hold a current driver’s license issued in Australia or an international drivers licence approved for Australia. The customer will not at any time while driving be under the influence of alcohol or of any drug. The customer’s current drivers licence must be presented on pick up. No hired vehicles are permitted to go further north of Indian Head on the Eastern side. No hired vehicles are permitted to travel between Wathumba and Moon Point on the western side. The reason for this is that the sands in these parts can be very soft and treacherous and these areas are quite remote. There are also “No Vehicle Zones” and some tracks that are occasionally closed for maintenance or rehabilitation. These are also not to be driven on. Our vehicles are insured. It is up to the customer to have personal effects cover with their own insurance. Any traffic infringements will be passed on to the customer. An $80 administration fee will apply. If you hire one of our vehicles, you will need to sign the terms and conditions to acknowledge you understand those terms and conditions. We will email a copy of our full terms and conditions with our rental agreement upon booking.